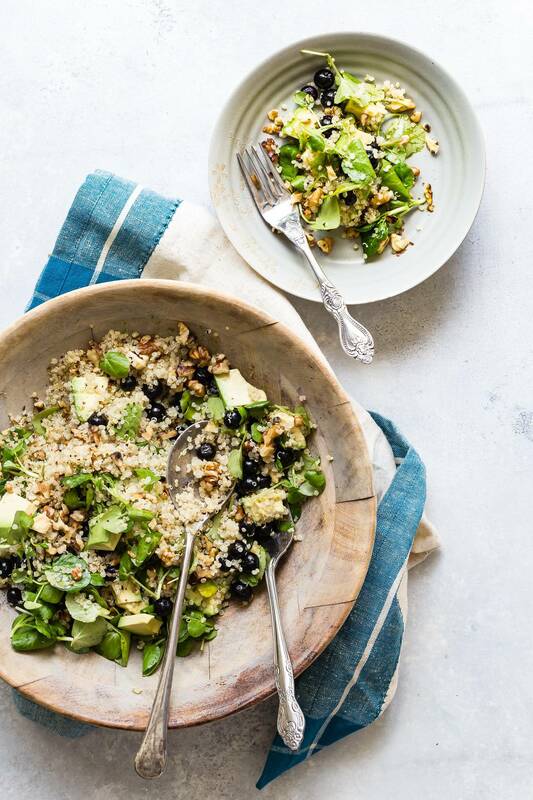 A fresh tasting blueberry quinoa salad with frozen blueberries, quinoa, walnuts, avocado and watercress leaves. After combining all of these amazing ingredients, toss them in a simple lemon and olive oil dressing! Lately I’ve been really into grain bowls as opposed to a salad with lots of leaves. There’s nothing wrong with the leaves but after a big bowl of healthy grains, I feel way more satisfied and I’m able to cut back on the snacks which get me every time! Quinoa is probably my favorite grain to go with. 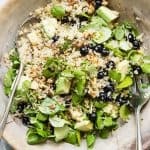 It’s pretty inexpensive and a little goes a long way, so when you make this Blueberry Quinoa Salad you can easily feed the family. Try adding some grilled shrimp or chicken for an extra protein boost. 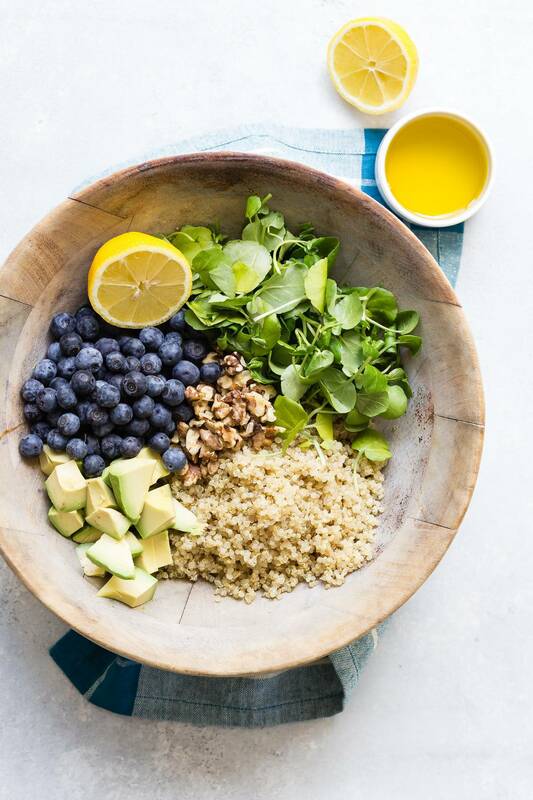 The flavors scream spring and summer with the blueberries adding a touch of sweetness along with the toasty walnuts and creamy avocado. This is definitely a feel good salad. Frozen blueberries have about 80 calories per cup and almost zero fat! They’re perfect for those watching cholesterol levels or looking to add more fiber in their diet. And what’s easier than tossing in a few handfuls of frozen blueberries? That’s why I always keep a bag or two in the freezer – for smoothies, a grain salad like this or even blueberry pancakes or muffins. The salad is loaded with a bunch of other awesome ingredients and can be made ahead of time. 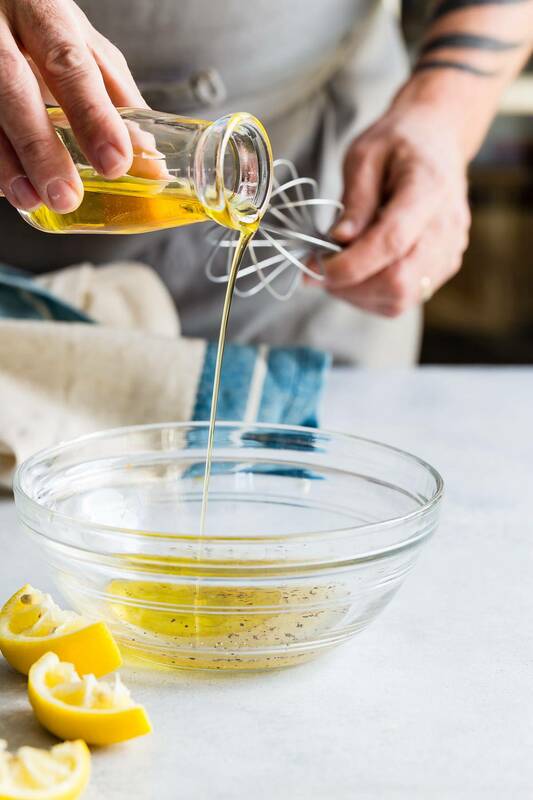 Just make sure to add the lemon and olive oil dressing right before you serve it. I’d add about half of the dressing and then decide if you need to add more. I can see this being my go-to salad this spring. 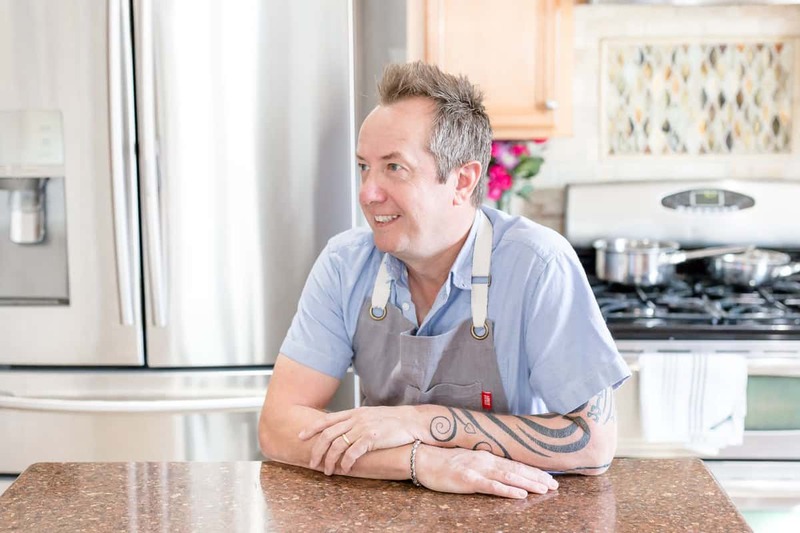 I tend to grill outdoors a lot so being in a hot kitchen does not sound like fun! Chicken, salmon or tai-tip, this salad will taste just as awesome with any of them! 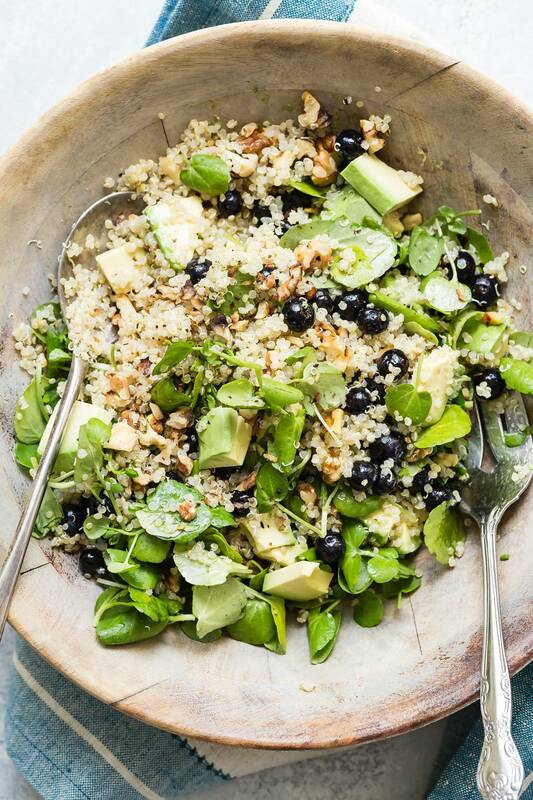 A fresh tasting salad with frozen blueberries, quinoa, walnuts, avocado and watercress leaves. After combining all of these amazing ingredients, toss them in a simple lemon and olive oil dressing! Whisk olive oil, lemon juice, kosher salt and pepper until blended. Stir in lemon zest. Toss with quinoa salad until evenly coated. This is the perfect spring salad! 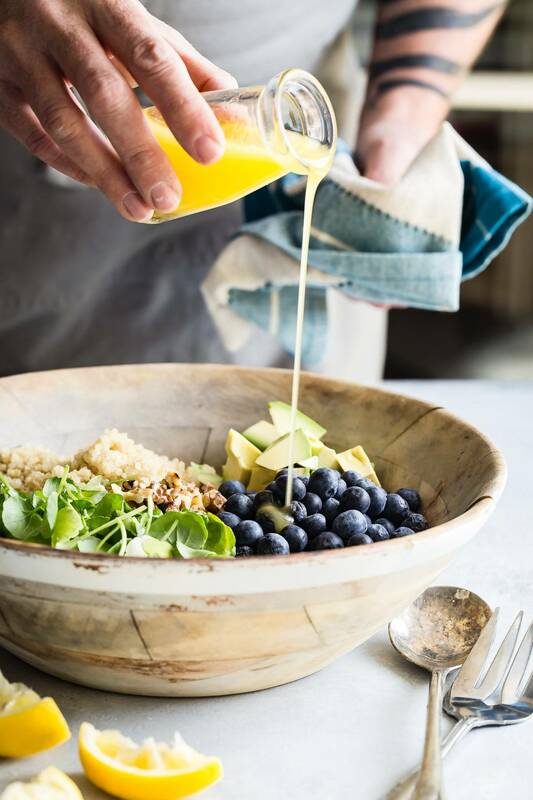 Love the blueberries with that lemon vinaigrette.